Meet4Eat is a social collaboration application which helps people making appointments for lunch, parties, and other forms of social gathering. Use Meet4Eat to organize your daily lunch with your colleagues. Organize public events and learn new people after work. Put a list of cool locations together and let's vote for what you and your friends like. 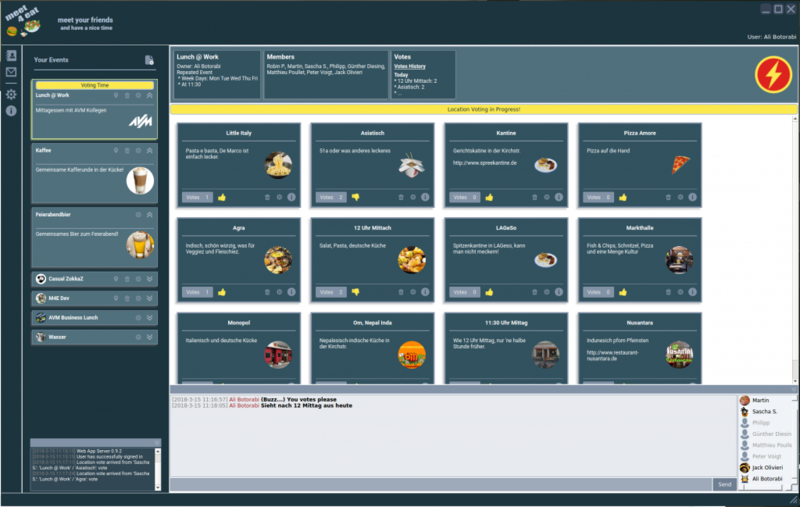 Get the Meet4Eat desktop client for MS Windows, MacOS, or Linux and begin to arrange your next gathering with your friends. Meet4Eat is the result of an open source development steered by VR Fun and hosted at GitHub, see https://github.com/botorabi/Meet4Eat. Feel free to contact us for more details.